Religious dressing is having something of a moment. There was the onslaught of inspiration from the crimson-dressed subjects of Netflix's Wild Wild Country, the supposed prairie dress trend from designer Batsheva Hay (according to media coverage those dresses are everywhere, but I have never seen anyone actually sport one in the wild). Yesterday's Telfar show felt like something of a church service, with a sermon delivered by playwright Jeremy O. Harris. But one designer is really nailing religious reference and reverence in his work: Graham Tyler Baldwin. Baldwin, trained as a sculptor and a milliner, debuted his eponymous label (called Graham Tyler, sans Baldwin) just last season, to great acclaim. Tyler is only in his mid-twenties, yet his aesthetic is strikingly sophisticated and elegant — he makes clothes that harken back to a time when all public outings called for a hat. This season he went even further back. Like, 17th century back. 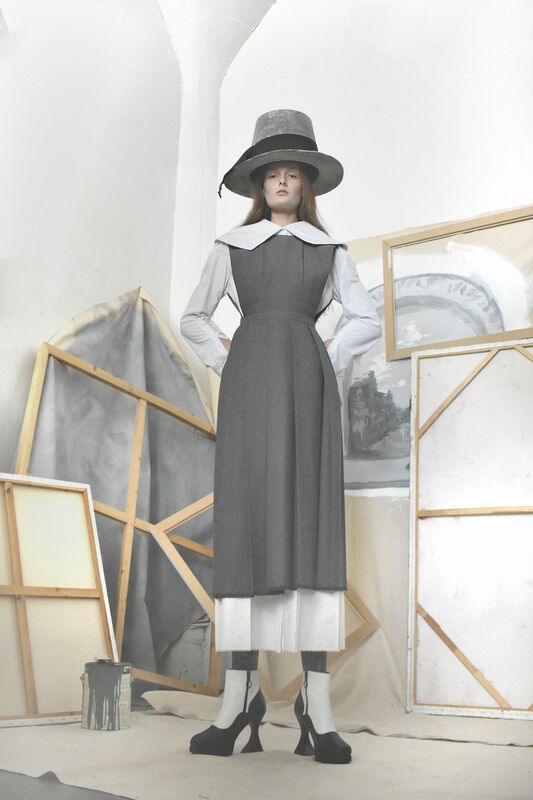 The Graham Tyler fall 2019 offerings had a real Puritan vibe, with an appropriately black, white, and grey palette; a standout black gown was styled with a bonnet and pilgrim-style belt buckle. But Baldwin, whose collection also included gorgeously made hats and corsets, is skilled enough that none of this feels false or costume-y. Many of the references came from his own background; the designer hails from Interlaken in upstate New York, near an Amish community, and there were touches inspired by their traditional dress. He used a print from a mural on the wall of the church where his parents met. It's all so thoughtful. At a time when fashion seems increasingly faster and more impersonal, it's thrilling to see someone like Baldwin, who cares about his customers so very much. We can't wait to see more.